And the Studio Ghibli Blu-Ray feature film collection is now complete. Umi ga Kikoeru ("I Can Hear the Sea," aka "Ocean Waves") will be released on Blu-Ray in Japan this July 17. Word was made public on Disney's Japanese website this week. The high-definition disc will retail for 6,800Yen. Umi ga Kikoeru's DVD release from 2003 is still available, but I would expect to see a "remastered" edition, in keeping with the recent DVD remasters from the rest of the Ghibli catalog. I purchased this disc a decade ago, and it remains a prized addition to my movie library. In addition to the main feature, a 40-minute documentary reuniting the production team was also include (but, sadly, no English subtitles for this extra). We should expect to see everything translated to the BD. Umi was Studio Ghibli's 1993 "made-for-TV" feature, broadcast on Japan's NHK network, who are longtime collaborators with Hayao Miyazaki and Isao Takahata, dating back to Future Boy Conan in 1978. This production was created by Ghibli's young staff, many of whom had graduated from the studio's in-house animation school, which was founded to nurture new animation talent. Outside of Japan, we should expect to see Umi released in Australia and the UK, under the "Ocean Waves" title, as they have previously released the DVD edition years ago. Please don't ask about Disney releasing a Blu-Ray in the US. It's never going to happen. Perhaps GKids Films could step in and secure the rights? Please Please Please...I recommend that you start harassing them with emails as soon as possible. I highly recommend this movie. It's one of Studio Ghibli's neo-realist films, a "slice-of-life" drama in the style of Omohide Poro Poro, Mimi wo Sumaseba, From Up on Poppy Hill, and The Wind Rises. 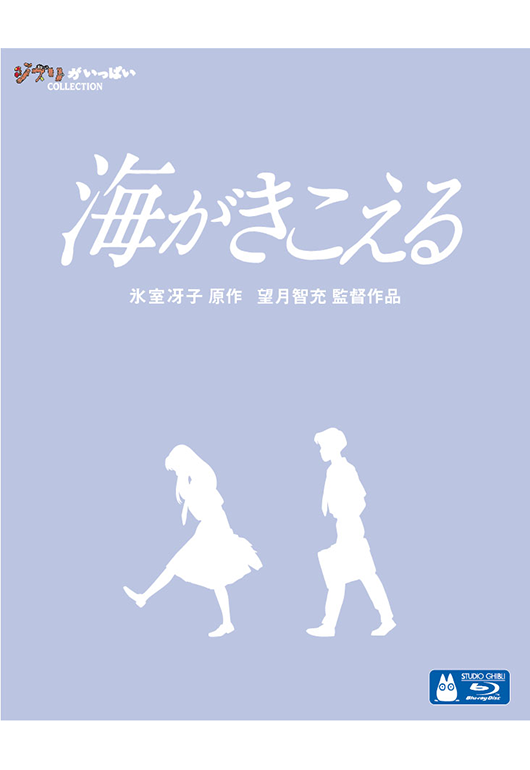 A teenage romance with wit, humor, longing, and a keen sense of wisdom, with an climactic final scene that sweeps you off your feet (and openly quotes Yasujiro Ozu). "I Can Hear the Sea"...Ghibli always loved to give their animated movies such flowing, poetic names. They demonstrate a mastery of an animation form that isn't even being conceived here in the West. This style of art does not exist on our shores, and it's a damned shame, and I'm getting tired of repeating this same phrase, year after year. We await a new generation of animation storytellers, inspired by these works, to create naturalist animations of their own. It can be done. It should be done. Special props should go to the Ghibli fan crew at the Blu-Ray.com forums, who first broke the news that Umi was being prepared for BD. Thanks to everyone for their due diligence. I wouldn't count on a U.S. release period. Just another title to put on my already costly import list (screw you for lack of U.S. releases and the dubtitles, Disney!). Darn it! It's not available on Amazon.jp yet! I'm super excited to get this! To be honest, I doubt that we're going to get a Blu-Ray release here in the UK (or in Australia for that matter). They skipped over Only Yesterday, despite releasing it on DVD, and I'd say that Ocean Waves will probably fall into the same category.